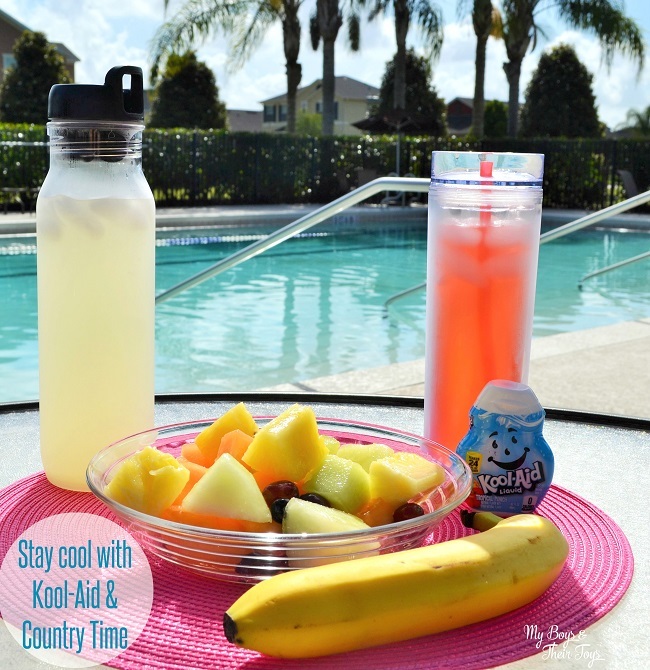 Whether we’re taking an impromptu trip to the pool or beach, or hosting a big summer bash – Kool-Aid Easy Mix Liquid and Country Time Lemonade Starter keep us cool. 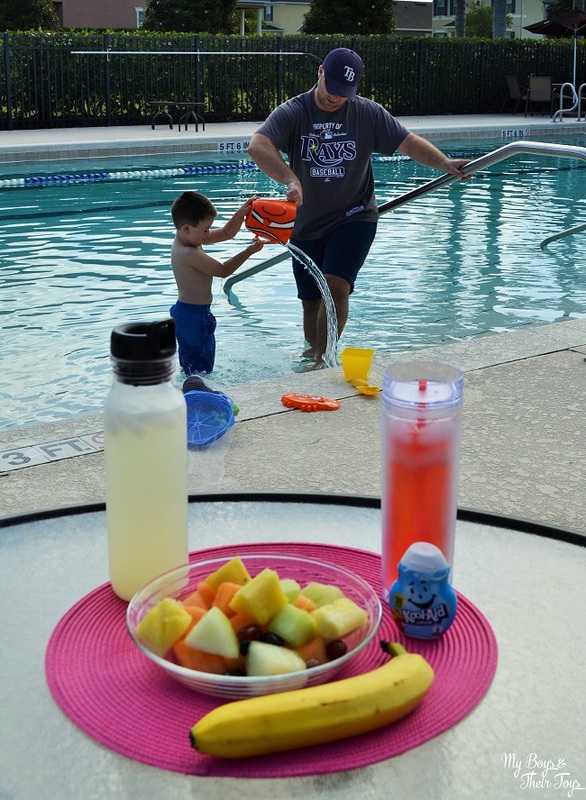 Their easy mix products allow me to spend less time in the kitchen and more time having fun with the family. Kool-Aid Easy Mix Liquid is presweetened, so all I need to do is add water. The easy-pour spout makes it very convenient, and with 50% less sugar than leading sodas, I can feel good about offering Kool-Aid to my family. I love to drink lemonade year-round. 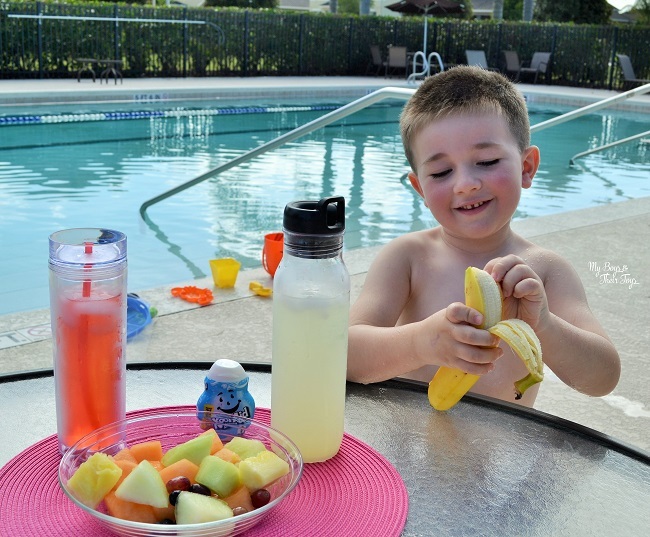 It’s one of my favorite drinks – and always makes me think of never-ending summer fun! Country Time Lemonade Starter is flavored with real lemon juice and comes in a variety of flavors: Half-Lemonade and Half-Iced Tea, Berry Lemonade and Classic Lemonade. 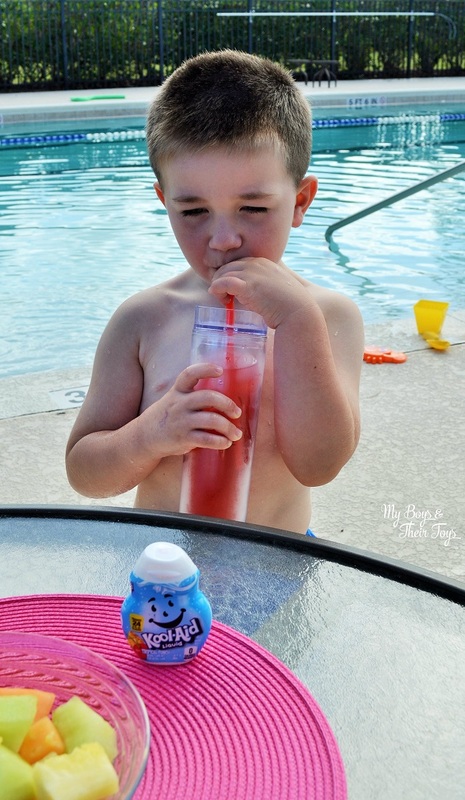 Any time my guys need to cool off from the summer heat- they can rely on a cold glass of Kool-Aid or Country Time beverages. For little ones, create a ball pit pool. Use a small blow-up pool to fill with plastic balls and let them jump in. This is something that can be done year-round! Make popsicles! So what if it’s chilly outside – popsicles are always fun to eat and make. Make an ice cream sundae bar. Even in cooler months, an ice cream treat can always bring a smile to your face. Create a sandpit in the backyard. Whether it’s warm or cold outside, that’s a simple way to bring the beach to you. I swear my little guy is a fruit-atarian. Yes, I made that word up. 😉 He requests fruit daily – sometimes more than once! Want to join the fun? Head here to create your own never-ending summer card. Check out mine below! You can even add music to your card and share it via social media. Then, stop in to Walmart for Kool-Aid Easy Mix Liquid and Country Time Lemonade Starter mixes! Today’s post is sponsored by Lunchbox, but all opinions are my own. I love Country Time! So good! I love these mixes, and don’t they look good with that amazing pool. I’m looking forward to summertime!